Note: On Professional, edit and publish permissions are assigned together to a user segment of agents. On Enterprise, editing and publishing permissions are assigned separately, so that they can be assigned to different user segments. Depending on your account, you might also have an Agents and managers management permission pre-generated for you. You can create custom management permissions as needed, up to 200. Management permissions include editing and publishing permissions. On Professional, edit and publish permissions are assigned together to a user segment of agents. On Enterprise, editing and publishing permissions are assigned separately, so that they can be assigned to different user segments. To build management permissions, you choose a user segment (see Creating user segments) to give those agents editing and publishing permissions. You then apply that management permission to the appropriate articles. You must be a Guide Manager to create management permissions. In Guide Admin, click the User permissions icon ( ) in the sidebar. Enter a name for this management permission. Click Apply user segment to assign permissions to a user segment of agents. You can choose only staff member user segments, not end-users. You can apply multiple user segments. On Professional, you assign edit and publish permissions together, to a user segment of agents. Agents with edit and publish permissions can view, create, and update articles, as well as submit for review, publish, unpublish, and archive articles, where this management permission is applied. See the complete list of agent privileges. On Enterprise, you assign edit permissions and publish permissions separately to the same or different user segments of agents. Agents with edit permissions can view, create, and update articles, as well as submit articles for review where this management permission is applied. Agents with publish permissions have edit permissions, plus they can publish, unpublish, and archive articles. See the complete list of agent privileges. Click Back to return to the Management permissions page. After you create management permissions, you can apply it to an article to determine agent editing and publishing access for that article. 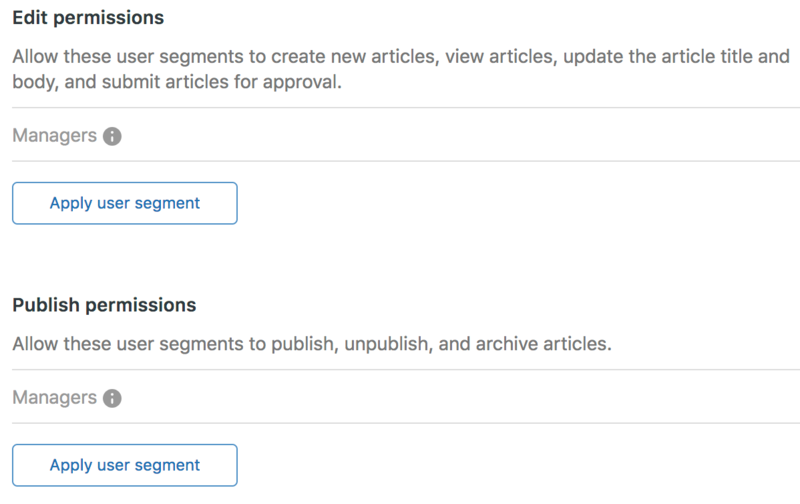 You can apply management permissions to an existing article or a new article. Guide Managers can apply any management permissions to an article, while agents can apply only the management permissions they belong to. Management permissions include editing and publishing permissions. Remember, on Professional, edit and publish permissions are assigned together and give agents one set of management privileges for knowledge base articles. On Enterprise, editing and publishing permissions are assigned separately and give agents separate edit and publish privileges knowledge base articles. The following table includes the complete list of agent privileges granted by edit and publish permissions for each plan. Guide Legacy customers should refer to the Guide Professional column.